Each year, the Small Business Commerce Association identifies businesses that they believe have achieved exceptional success in their local community. Award winners are chosen from nominees by a selection committee based off information from monthly surveys administered by the SBCA, and review of over 100,000 consumer rankings and other consumer reports. Nominees are typically local businesses that enhance the positive image of small business through service to their customers and community. These are businesses that are delighting their customers and providing exceptional goods and/or services. Outskirts Press is pleased to announce that the SBCA has awarded Outskirts Press with the Best of Business Award in Publishing. 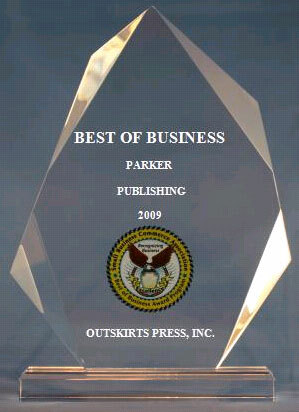 Outskirts Press, Inc. has been selected for the 2009 Best of Business Award in the Publishing category by the Small Business Commerce Association (SBCA). The Small Business Commerce Association (SBCA) is pleased to announce that Outskirts Press, Inc. has been selected for the 2009 Best of Business Award in the Publishing category.